White70, Rodhhrod, WesternRed, and others, I've talked to each of you on this subject, so if you have more to add, I'd appreciate your comments. I've been studying the TSM Tach schematics in order to integrate my MSD 8523 Ready-to-Run Dist. and Blaster II with my factory 8K tach. I believe I have to solution, but would like input. The MSD installation manual says to connect the dist. orange and red wires to the coil and have 12v feeding the coil for power. I don't believe the factory 8K tach will handle a full 12v as the TSM schematics indicates a lower voltage with the use of the double yellow wire connection at the I terminal of the solenoid. It's the MSD dist that requires 12v to operate correctly. I BELIEVE the coil works at its best at 12v, however, if the Blaster II is used with a points dist., a ballast resistor is required thus running at a lower voltage. So, the drawing below shows my wiring of the MSD dist as well as the TSM tach wiring from the I terminal to the tach, then to the coil. I removed the MSD recommended RED wire from the + side of the coil and connected to the ignition 'run' wire to meet the 12v requirement of the dist. The tach worked flawlessly. So, my question is: if a points dist. 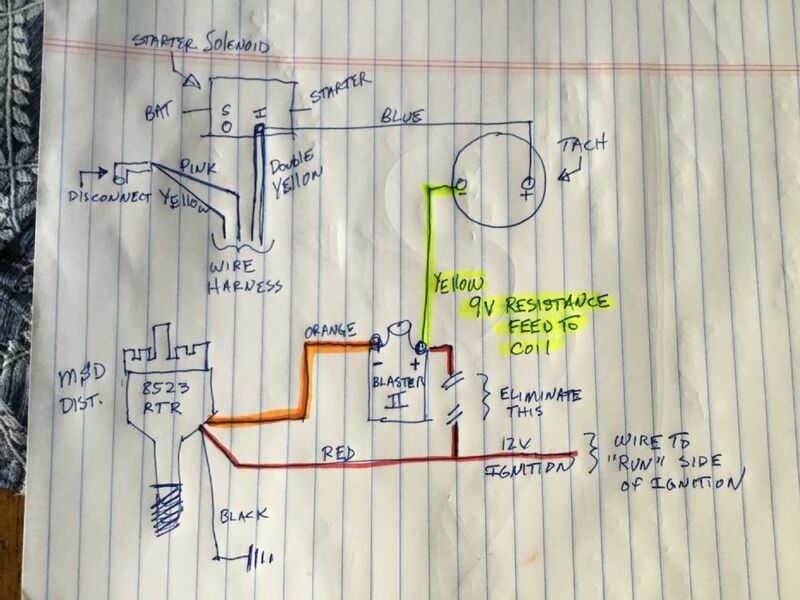 requires the Blaster II to incorporate a ballast resistor, therefore, running a lower voltage so as not to burn up the points, why can't I run the same lower voltage (power feed from the double yellow wires through the blue tach wire)to feed the coil AS LONG AS I have a full 12v requirement feeding the MSD dist.? Very nice work on this, this has been an issue for a very long time. If this works, it will save folks a lot of money on tach conversion. I hope folks who try this will post results. I have already done the tach conversion years ago. I am really surprised that no one has posted a comment on this. I don't know how I missed this thread. I don't recall using any thing other than the Billet ready to run MSD distributor and wiring it into the ignition circuit and AMC factory in dash 8K tachometer circuit somehow. I wish I could remember. I will have to take a look at it to refresh my memory, I did this conversion at least 10 or 12 years ago and have been putting 1500 to 2000 miles on the car each year after, no troubles with tachometer or distributor. Ok, AMC forum people, I'm your newest member and I'm having some serious electrical issues. I put the RTR msd distributor in my car (1970 javelin) with the blaster coil. I used the old wires that went to the coil on the new coil. Car wouldn't run. Until I put the battery charger on because the battery started to die. Then I figured out, I wasn't getting 12 volts to the coil (then distributor ) to run. MSD told me to run a jumper right off the battery to the coil to make sure not an engine problem. With jumper wire, car ran great. So, now I'm trying to figure out how to wire it correctly with 12 volts, without cooking something else. Looking at the diagram in this thread, please explain what a "9 volt resistance wire" is. My car has the factory tach. Does that mean using the regular yellow tach wire? Or installing something else? One more thing. What is the "double yellow" wire on the solenoid? My car has the pink/yellow wire at the solenoid, which it says to leave unattatched, but I have no double yellow wire?! I have green wire at the solenoid for neutral safety switch. And blue tach wire. No other wires at solenoid. The 3 yellow wires that went to the original coil- 1 from the tach, 1 from voltage regulator, and one from the solenoid (attatched to the same plug as the pink wire) Please help. Once this problem is figured out, I have 2 more I need help with. The original point ignition system used a resistor between the ignition and the coil to reduce amperage so points would not burn. Everything in the ignition system, including the tachometer were built around this. Now an MSD distributor needs full system voltage - typically 14.2, no resistor. The MSD distributor puts out multiple spark firings per cycle - not one like the points. The old tachometer cannot read this. MSD sells a box for old tachometers to make a single pulse. This voltage reduction resistor can be doing the same thing by reducing signal so only one pulse is seen by the tachometer. A capacitor with the resistor to filter the pulses should work better, I believe this is what the expensive MSD box basically is. Wow, there were a lot of complicated words in your response. (I'm not mechanically inclined) Here's what I know. Putting the battery charger on high, hooked up to the battery, with original 3 wires going to the coil. Motor runs great, and tach works. Unhooking 3 wires going to coil and running jumper wire from battery to coil without charger on, car runs great, but no tach. (Because tach wire isn't hooked up) But can't shut the car off. So, if I run red power wire to column "run" wire for 12 volts, can I rehook up the tach wire directly to the coil and be ok. Or will to much juice somehow get to the tach and hurt it. Also what about the other 2 yellow wires? I understand I can probably leave the one going to the voltage regulator unhooked,but the other one? And they're hooked together at the coil. Also, witch wire actually starts the car? The diagram above works but disconnect the yellow wire to the tachometer completely. Ensure the wire 12 VDC from the ignition switch does not have a resistor in it. Full system voltage to the distributor. The MSD 8523 should have a grey wire off the distributor terminal. It may or may not operate your tachometer. If it does not then buy the MSD box for the tachometer or you can try some other "filter". But be warned that tachometers are voltage sensitive and can be "fried" easily. MSD says to run 12v to the coil. From the coil, you’re to run 12v to the rtr dist. This because the DISTRIBUTOR needs 12v to operate properly. The blaster II coil will handle 12v optimally but with the AMC tach in-line/in series with this new electronic ignition, it (tach) won’t function properly and will ultimately burn up. > The issue with our AMCs is that the existing wiring harness to the disturbutor took voltage from 12v to ~9.6v with the use of a resistance wire (this is the pink wire). Other manufacturers used an in-line ballast resistor. Whether it’s a pink wire or ballast resistor, they are doing the same function - cutting voltage to the points they the coil to keep them from burning up. > Don’t use the rtr grey wire. The wave electrical signal is not compatible with the AMC tach. > There is no MSD adapter to interface between the rtr distr and the AMC tach. So, the distributor needs 12v and you want to have your Javelin to start and turn off with the key 👍. You need to run a wire directly to the distributor from a 12v source that is powered when the key is moved to the “on” position. Get yourself a wiring diagram to locate the correct wire at the fuse panel and tap into it. > You’re not going to find this “on” power source in the engine compartment like you have done by directly wiring from the battery. Now, back to the pink wire. It is directly connected to a yellow wire. This yellow wire takes the 9.6v from the pink wire to ‘excite’ the charging system at startup. AND, the yellow wire also splits off to connects to the double yellow spade connector. This spade connector is the power source to the coil which fed from the “I” terminal on the solenoid thru the blue wire, to the tach and then to the coil (yellow wire). Follow the above, I believe you will have success.